Healthy Ride and the Port Authority of Allegheny County are partnering to bring free bike share to transit riders in Pittsburgh. Starting September 28th, all Port Authority customers who use a ConnectCard will receive unlimited 15-minute rides with Healthy Ride when they link their ConnectCard at select Healthy Ride stations. Stations at Market Square and Liberty Ave. and Stanwix St. are currently accepting ConnectCards, and the remaining 48 stations will be upgraded in the coming weeks. The benefit to transit users is the first of its kind in the US. 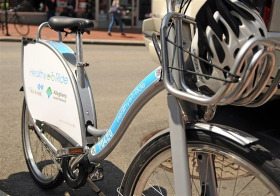 Transit integration between multiple transportation providers is an emerging trend in cities around the globe; Pittsburgh being the first in the US to offer free bike share credit as an incentive to include active transportation in daily commuting. "This is a great way of providing the first-mile, last-mile connections to transit that so many of our residents need. Pittsburgh is once again leading the nation when it comes to forward-thinking transportation initiatives," Mayor William Peduto said. ConnectCard integration with the Healthy Ride bike share system will help transit riders complete the first or last leg of their commute by bike. Port Authority riders now have the opportunity to use two separate services with the convenience and affordability of their ConnectCard. To use the system, riders must first connect their ConnectCard using any of the fifty Healthy Ride kiosks in town. "ConnectCard provides transit customers with a simple and convenient way to use public transportation, and now that same convenience is extended to the Healthy Ride network," said Interim Port Authority CEO David Donahoe. "From discounts on Pirates tickets to free time on Healthy Ride, the ConnectCard offers tremendous value." After the first ride users can simply tap their ConnectCard on the back of any Healthy Ride bike they wish to rent. Riders will not need to link a method of payment to their account until they exceed their 15-minute ride time. While the ConnectCard provides a gateway to both services, Healthy Ride and ConnectCard customer accounts will remain separate. The two systems share the same smart card technology, which allows for this dual use. For more information, visit change.healthyridepgh.org.